« Somethin’ Else » is the perfect example that only jazz could do while the other musical genres don’t allow cross-overs. Especially in the 50s, musicians are still keen on respecting a more strict behaviour in the pure tradition of their main genre by not exploring beyond without fearing losing their audience. Only Jazz, music of freedom, whose essence is the beat of the swing, of any melody recycled whatever its source, could break the barriers between its inner trends same as it did between the races and all beliefs across the world. « Autumn Leaves », the first track, with its strange scary introduction, is one of the most popular French melody composed by Joseph Kosma who’s got an Hungarian origin. This tune has been sung by various artists and Yves Montand is one of its most brilliant interpreters. Miles exposes the main theme then the sax improvises followed by the trumpet and the piano before Miles concludes with the recall of the theme; but he’s Hank Jones who improvises the long coda with Miles in a cool way, very different than the swinging body of the track. So surprising and really refined. In « Love for Sale » Hank Jones improvises less but introduces this swinging latino flavoured track in which Miles plays again the main theme. A tune composed by the fancy Cole Porter a white American man known for his homosexuality. « One for Daddy-O », dedicated to the popular Chicago disc-jockey « Daddy-O » is introduced by the piano, Cannonball plays the main theme and improvises first followed by the Davis’ trumpet. Normal! 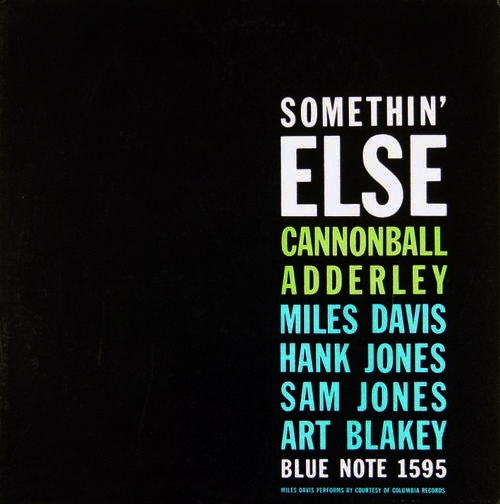 This track has been composed by Nat Adderley, Cannonball’s brother. They are not brothers for nothing… After a piano improvisation, the 3 leaders share the replay of the theme but Cannonball has got the last note. At last, « Dancing in the Dark » is a popular American white song composed by Arthur Schwartz. Cannonball plays alone the theme and the improvisations only backed by the piano, the drums and double-bass. Miles made him play this tune because he remembered Sarah Vaughan do it like this. In this ballad, Miles Davis does not play. Is this a true example of modesty and dedication to the Music only? Probably yes. As a conclusion I will say that this album implicitly carries more emotion and freedom blood than any political speech because of its concept and its various sources. Unfortunately it takes years to understand the alchemy of Jazz and how many people can understand it beyong its technical skill and swing outward? Simply one of the most important milestones of the 50s and Music simply. 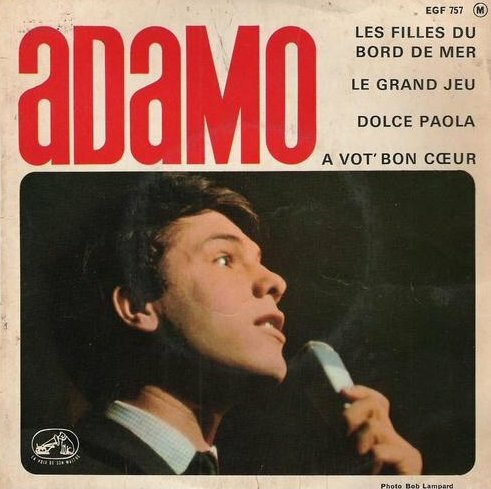 À 65 ans, Adamo a retrouvé le chemin des hit-parades qu’il avait désertés depuis longtemps. Si dans les années 60, cet auteur-compositeur-interprète avait signé un certain nombre de chansons au-dessus de la moyenne, on ne peut plus en dire autant avec ces reprises en duo avec ces jeunes artistes chantant plus mal les uns que les autres. Adamo est lui-même vocalement atteint par la limite d’âge et ça s’entend. Bénabar se ridiculise en lui faisant la réplique dans « Vous permettez monsieur ». Voulzy et Souchon chantent sans âme tandis que Raphaël et Cali sont toujours aussi insupportables. Adrienne Pauly est outrageusement vulgaire dans « En blue-jeans et blouson de cuir ». Le répertoire ici présent est composé d’une douzaine de chansons très connues sur 18. Dans les 6 autres il y en a du tout début des années 60 et des autres beaucoup plus récentes et encore moins connues. L’orchestration est très banale et même s’il n’y a pas trop de synthés, on reste loin des versions d’antan. Comme beaucoup d’autres Adamo a tenté de faire du neuf avec du vieux mais au final on est loin du compte malgré la belle brochette d’invités. Come back commercial réussi ; musical, non. 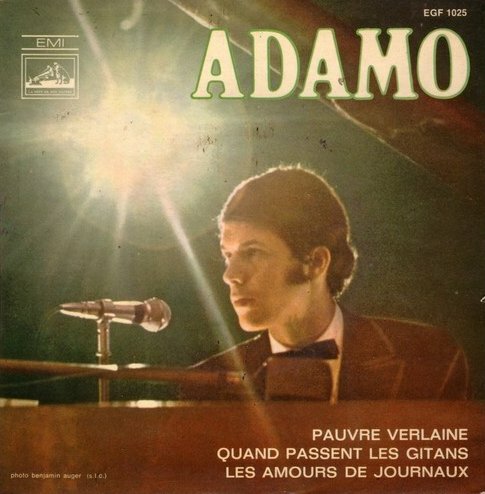 « Pauvre Verlaine » est indiscutablement la plus grande chanson d’Adamo. La mélodie est d’une grande beauté et le texte très poétique. Les arrangements sont assez raffinés sans trop de pathos sur les cordes comme c’est souvent le cas dans ce style de ballade triste à pleurer. « Quand passent les gitans » est assez attachant et se retient facilement. « Les amours de journaux » est un divertissement au texte amusant. Un des meilleurs EPs d’Adamo. 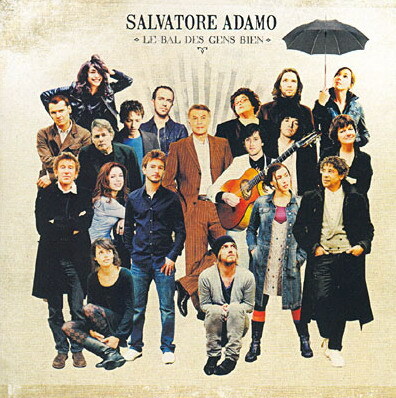 Pendant mon adolescence j’étais un fan d’Adamo. J’appréciais son côté un peu naïf et romantique à la fois. Maintenant c’est plutôt nostalgique car tout ça a tout de même pas mal vieilli. Ce EP, hormis « À vot’ bon cœur » qui est amusant ne m’a jamais plu. « Les filles du bord de mer » fait partie des chansons les plus idiotes du début des années 60. De plus Adamo la chante d’une manière ridicule, là où il voudrait se faire passer pour drôle. « Le grand jeu » est épouvantable surtout avec ses chœurs féminins répétant inlassablement « Cha-lala, Cha-lala ». 2* pour « À vot’ bon cœur » qui n’arrive pas vraiment à sauver ce EP. Adamo – Vous permettez, monsieur ?